Blues in the classic British tradition, but with a modern twist. Think Bluesbreakers, Yardbirds and Free. Featuring Howlin' George Witter, Jamaican by birth, bluesman by calling. 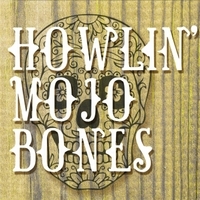 Howlin’ Mojo Bones are a 4 piece blues band based in North East London. Formed in 2016, the band is already making waves on the live circuit with their distinctive, hard-driving, modern blues sound. The band is built around the voice of Howlin’ George Witter, a stalwart of the North London blues scene for many years. George was born in Jamaica but came to London in the mid-sixties. He’s seen some tough times, having suffered a severe bout of polio when he was six, which left him unable to walk without the aid of crutches. He says that when he realised he would never be able to play football, music first became a comfort, then a calling. George’s meeting guitarist Steve Crane was pivotal. He says it was like finding a musical soul mate. There was an instant musical connection, which, when coupled with the powerful rhythm section of John Baker on drums and Mick Whitbread on bass, forged the distinctive sound of Howlin’ Mojo Bones.